How frustrating is it when a pipe bursts, and you have to wait hours for a plumber to come replace or repair it? How about being stranded on the side of the road with a flat tire? Or when your toddler's plastic train breaks apart, and a tantrum ensues? Researchers at the CIDETEC Centre for Electrochemical Technologies in San Sebastian, Spain, may have just created a quick fix for all of these headaches, and many more: You might someday be able to just hold the broken plastic pieces back together, and watch them fuse before your eyes. Plastics are made up of polymers, a long chain of molecules that are connected through chemical bonds. Natural polymers are everywhere. They make up the shells that protect lobsters and shrimp, they're in the silk blouse your grandmother so adores and the DNA that makes you, well, you. In nature, many polymers heal themselves when broken or sliced. Think of your skin when you have a small cut  as the two sides of the cut bind back together, you're witnessing a self-healing polymer in action. Synthetic polymers are just as common. Scientists started creating nylon and synthetic rubber to make up for the shortage of silk and rubber during World War II. PVC, polyester and many forms of plastic soon followed. As much as synthetic polymers mimic natural polymers, they've always lacked one important feature, the ability to heal themselves  until now. The Spanish scientists recently created a polymer that can bind itself back together even after being sliced with a razor blade, without the help of a catalyst. This is the first man-made self-healing polymer to function without a catalyst, they report in the Sept. 13 issue of the journal Materials Horizon. Nicknamed "Terminator" because it seems to be as resilient as the T-100 terminator robot from Terminator 2, the polymer was sliced in two in the research lab. 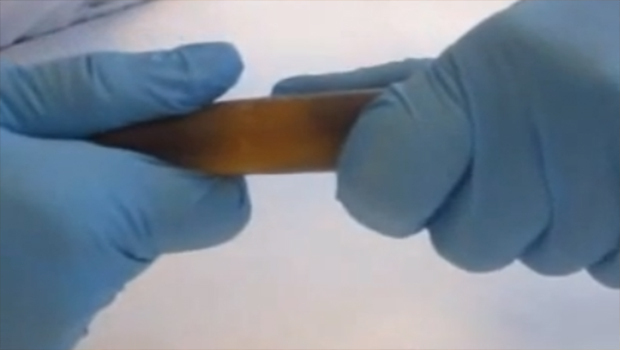 "First, a pristine cylinder made from [the polymer] was cut in half with a knife. Then the two halves were put in contact and allowed to stand at room-temperature, without applying any pressure," the authors explained. "Terminator" started self-healing within an hour. It was 97 percent healed within two hours, and completely fused after 22 hours. Once it had repaired itself, the scientists were able to stretch it manually, with no ruptures or tears. In 2011, researchers at Case Western Reserve University created a self-healing polymer that needed to be placed under a UV light in order to heal. In that case, the polymer worked as a coating that could seal surface scratches on things like cars and dining room tables. In this study, the polymer is a type of thermoset elastometer. The scientists created it using common polymeric starter materials, just as they would in order to create other known synthetic polymers. "The idea behind this is to reconnect the chemical crosslinks which are broken when a material fractures, restoring the integrity of the material. This is expected to provide polymers with enhanced lifetime and resistance to fatigue," the authors wrote in the study. When the polymer was at room temperature, bis(4-aminophenyl) disulfides were exchanged between the two slices of the polymer through metathesis. The exchange facilitated the regeneration. The researchers say this breakthrough will allow them to create stronger sealants, paints, adhesives and more. This could eventually lead to self-repairing pipes, bicycle tires and Barbie dolls, among a million other possibilities. "The fact that poly(urea-urethane)s with similar chemical composition and mechanical properties are already used in a wide range of commercial products makes this system very attractive for a fast and easy implementation in real industrial applications," they wrote.